Free Shipping Included! 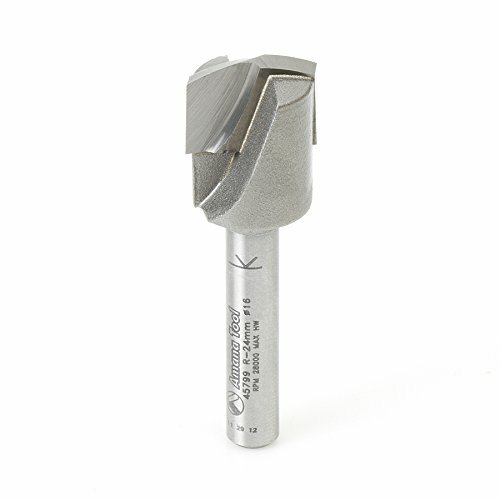 Amana Tool 45799 Rectangular Groove for Thick Aluminum Composite Material (ACM) Panels Like Alucobond, Dibond, 15/16 R x 7/16 CH x 5/8 D x 1/4 Inch SHK Carbide Tipped Router Bit by Amana Tool at UCBC Group. MPN: 45799. Hurry! Limited time offer. Offer valid only while supplies last. Industrial Quality Signmaking, Lettering, V Groove Miter Fold are made by Amana Tool, the leading manufacturers of high-quality wood-cutting tools. Industrial Quality Signmaking, Lettering, V Groove Miter Fold are made by Amana Tool, the leading manufacturers of high-quality wood-cutting tools. Amana Tool 45799 Rectangular Groove for Thick Aluminum Composite Material (ACM) Panels Like Alucobond, Dibond, 15/16 R x 7/16 CH x 5/8 D x 1/4 Inch SHK Carbide Tipped Router Bit is designedfor shaping Aluminum Composite Materials (ACM).Routing rectangular-shaped grooves, whereby the aluminum cover and a part of the polyethylene core is removed, allows folding/creasing the remaining material by hand. Excellent for cutting: Aluminum, Clay, Zinc & Wood Composite Panels, Aluminium Composite Materials (ACM), Aluminium Composite Panel (ACP), ALPOLIC Copper Composite Material (CCM), Alucobond, Alupanel, Coroplast, Dibond, Durabond, e-panel, Etalbond, Phenolics, Plastic/Acrylic, Plexiglas, Titanium Composite Material (TCM), Wood. SPECIFICATIONS: Diameter (D): 5/8; Radius (R): 15/16; Cutting Height (B): 7/16; Shank (d): 1/4; Overall Length (L): 2; Type: Carbide Tipped Rectangular Groove (for thicker panels); Max RPM: 28,000; Flutes: 2.